Despicable Me 3 will likely be the biggest earning film of the summer movie season and today Universal and Illumination have released the second trailer for the film. 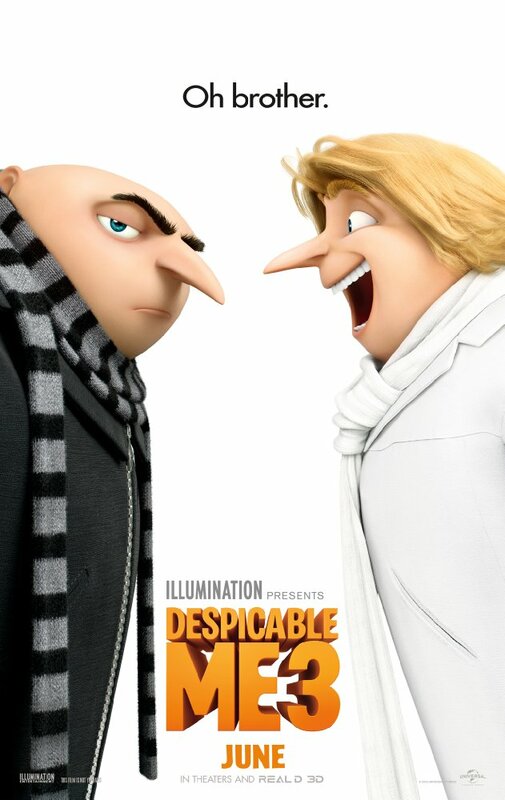 While I never expected in the summer of 2010 while watching the genuinely fun and inventive Despicable Me that it would become one of the biggest animated franchises of its day here we sit seven years later and four films in as not only has Gru (Steve Carell) and his minions received two sequels, but his minions themselves have had their own movie. After the underwhelming sequel though and rather bad Minions spin-off my expectation for anything noteworthy to come out of this franchise has significantly decreased. Sure, there are still a few funny bits in this second trailer it seems to be a totally different third installment than what the previous trailer pitched. Whereas the clip released in December highlighted Gru coming up against a new villain Balthazar Bratt (voiced by Trey Parker) this new trailer solely focuses on the reveal that Gru somehow has a twin brother we've never heard about and that there will be a wrestling of the conscience on Gru's part over whether to remain true to his new life or fall back into being a bad guy. If anything, this trailer makes it seem as if Parker's Bratt is simply the cold open villain in a bit meant to pull in parents of children whose adolescence took place when South Park was in its heyday with the 80's-inspired character further capitalizing on our current nostalgic fascination with that decade. While I certainly hope that isn't the case given the initial trailer was much funnier than this one, we shall have to wait and see exactly how Gru's ever-expanding story unfolds. Still of note, there are more minions to be seen here than Gru's daughters which, if you might recall, were really the heart and soul of that original film and could certainly serve that purpose again here with the introduction of Dru (also voiced by Steve Carell). Of course, none of this really matters to Universal or Illumination as they both well know that Despicable 3 is destined to make buckets and buckets of money. Despicable Me 3 also features the voice talents of Kristen Wiig, Miranda Cosgrove, Russell Brand, Steve Coogan, Jenny Slate, Pierre Coffin, Dana Gaier, and opens on June 30, 2017. Synopsis: Joining Steve Carell and Kristen Wiig in Despicable Me 3 is Emmy, Tony and Grammy Award winner Trey Parker, co-creator of Comedy Central’s global phenomenon South Park and the Broadway smash The Book of Mormon. Parker voices the role of villain Balthazar Bratt, a former child star who’s grown up to become obsessed with the character he played in the ‘80s, and proves to be Gru’s most formidable nemesis to date.